Gettysburg Farm Thousand Trails is actually located around 18 miles northeast of the historic town of Gettysburg, but it is, indeed, a farm. There are fields, barns, and lots of farm animals. There are posted petting zoo times for those who want to get up close and personal with many of the animals. The baby goats are a big attraction. In keeping with the farm theme there are wagon rides through the corn field and around the campground and lots of antique pieces of farm equipment on display. We arrived right at the end of the campground’s second flooding event of the season. Conewago Creek skirts the campground and with all the rain Pennsylvania has had this summer, the creek has gotten out of hand at times. Most of the campsites aren’t impacted by the creek, but one section is right along the creek. It was closed because of the wet conditions all the time we were at Gettysburg Farm. I think those campsites and a few others are the only water/electric only spots in the park. The campground does, though, offer free “honey wagon” service to those without sewer. It was my impression that bigger rigs would fit better in the “city” portion of the campground, wet conditions or no. The majority of the campground is about equally divided between 30 and 50 amp full hookup back in spots, except for one row of back-to-back sites. In those, the first person to arrive gets what amounts to a pull-through site. The next one has to back in. Aside from the site differences I just described, I felt that the spots in the campground were pretty much equal with an adequate amount of space and level sites. As usual, many spots have been leased out to long term residents. That, along with having many creekside sites out of service, caused the remaining sites to be mostly all occupied over the weekends. During the week, though, there were a few vacant spots for travelers. We arrived the week after Labor Day and the pool was already drained for the winter. There’s a cute mini-golf course and nice basketball/pickleball area. There’s a small store that also serves food. My Verizon signal was weak but usable most of the time. One afternoon and evening it dropped to the point that it was unusable, but later that night it came back even stronger than before. My guess is that some work was being done on the tower and my phone was trying to pick up a more distant one. I had no problem getting satellite TV. 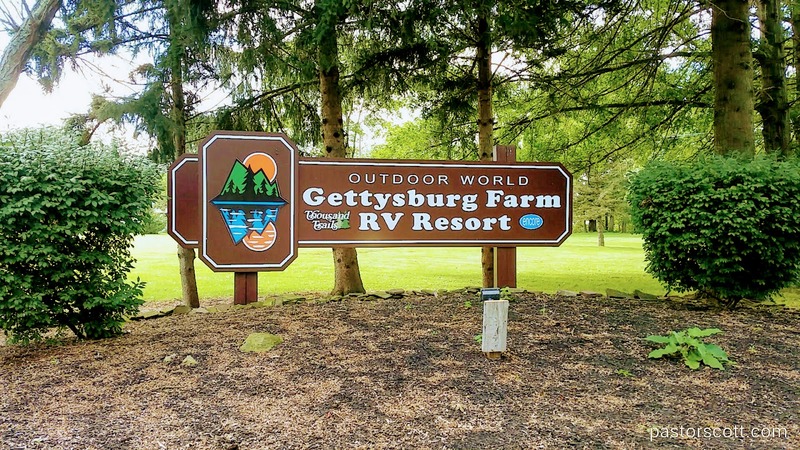 This being a nice campground that is near some interesting attractions makes, I think, Gettysburg Farm Thousand Trails a real winner. This entry was posted in Scott and tagged camping, Pennsylvania, review, Thousand Trails. Bookmark the permalink.